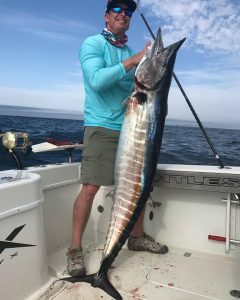 Spring is here, folks, and Venice is the place to be for outrageous offshore action aboard Relentless Sportfishing! 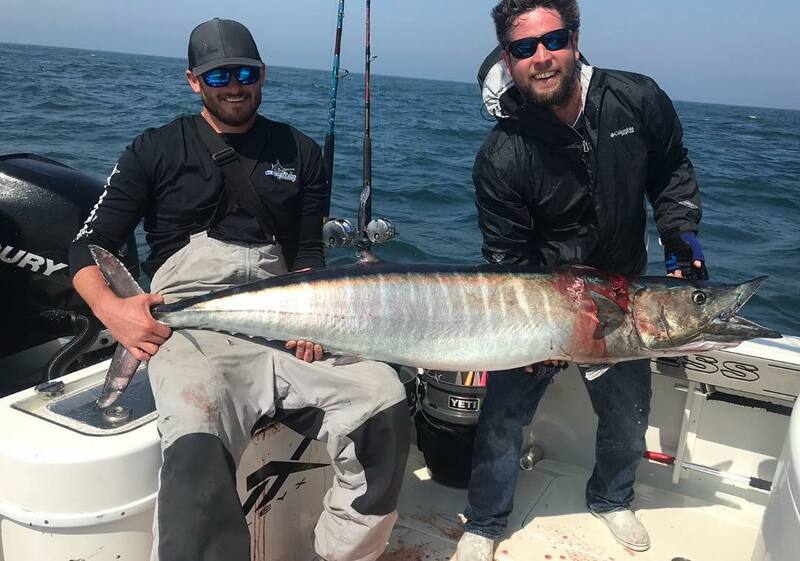 Not only is the Yellowfin Tuna bite on fire but we’re burning up drags with Wahoo and going through plenty of filet knives cleaning Swordfish. NOW is the time to book your epic fishing adventure if you want to fish with us in March or April! Normally, we’re all about the Tunas when fishing out of world-famous Venice, Louisiana. However, our clients have been screaming “Wahoo!” when we’re fishing around the oil rigs well offshore. 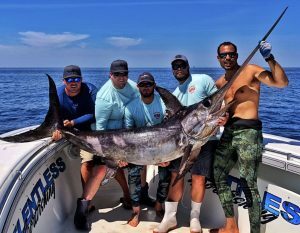 That’s because some stud Wahoo have been abusing our trolled artificials as we scout for Tunas. As you can see above, these are no “weehoos.” These are fully-grown toothy critters that just love to melt drags and break hearts. If you book with us in March or early April, you can go toe-to-toe with one of the fastest species in the Gulf. Period. Our fishery is best known for monster Yellowfin Tunas and they refuse to be upstaged by the red-hot Wahoo bite. We’ve been finding huge Yellowfins outside of 30 miles and they simply cannot refuse the live mullet, live hardtails or even the specially-crafted chunks that we’re pitching to them. As you can see, we’ve had no problems getting our clients to tangle with these butterballs, with the Yellowfins ranging from 60 lbs to 100 lbs and even larger. 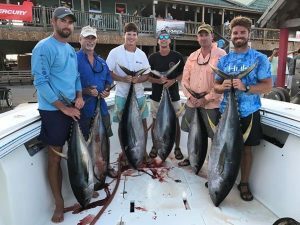 As if these giants weren’t enough action, there are large numbers of Blackfin Tuna mixed in with the Yellowfins and the Blackfins are averaging a respectable 20 lbs to 30 lbs themselves. If you’re lucky, they can get even bigger! 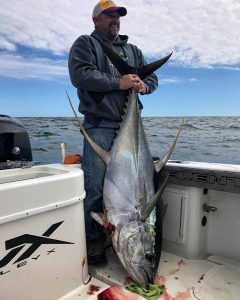 Recently, the Yellowfin bite has been so good that our clients have been catching their fill of Tunas early into our trips. We can’t just head back in. So, we’ve been daytime dropping down for Swordfish in depths exceeding 1,800 feet. Swordfishing is truly an amazing endeavor and takes a fair amount of skill and seamanship to keep the bait on target and know when a Swordfish is hooked up. Fortunately, our Relentless Sportfishing Team includes captains who make “daytiming” look easy! This kind of fishing really needs to be experienced to be believed. Call us to book your trip! 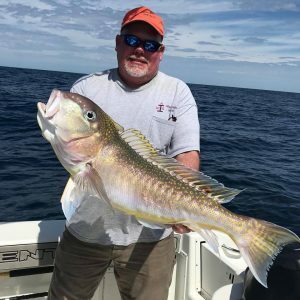 Another option for our clients has been deep dropping on a few of our “honey holes” for yet more tasty species like Snapper, Grouper and even Golden Tilefish. Check out this big Tile! So, you can see that none of our Relentless Sportfishing clients are going home hungry. We are sending our clients home with enough fish to feed a city block! Let’s get out there in comfort and safety in our 36′ Yellowfin center console. You won’t have much time to relax as we get you to the fishing grounds in a hurry courtesy of our triple outboards. You will feel like you are on rails. Isn’t it time that you got in on the action before the Spring patterns give way to Summer? What are you waiting for? Come be our guest as we introduce you to one of the world’s premier fisheries for the angling experience of a lifetime!